This guidebook entry was created by Janelle Corino. 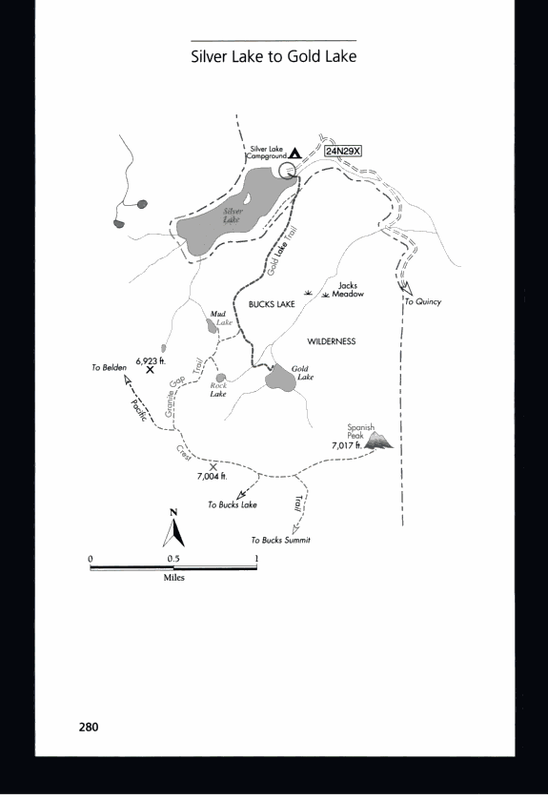 HISTORY: The Climbing area is located in the general area of Buck’s Lake Wilderness, Silver, Gold, and Rock Lake. These lakes share a history with the establishment of Buck’s Lake Wilderness. The land was first claimed as a Ranch, by Horance Bucklin and Francis Walker in 1850. The Ranch then became known as Buck’s Ranch. Mainly operating in the cattle industry, the Buck’s Ranch passed through the hands of many owners over the years. Later the land was developed into an important supply point for all of the mines located on the streams and rivers surrounding the valley. Eventually a portion of Buck’s ranch was designated a Wilderness in 1984. The area contains a total of 23,958 acres currently being managed by the U.S. Forest Service. DESCRIPTION: The Sliver Lake campsite is where you will start off on your adventure. This breath taking beautiful lake lies beneath Spanish Peak. Spanish Peak is the highest point in Buck’s Lake Wilderness at an elevation of 7,017 feet. As you wind your way around Silver Lake on your way towards Gold Lake you will find yourself surrounded by a mixed conifer forest, a great deal of Manzanita, and enough granite to excite those indifferent to geology. As you hike along the well made trail you will be presented with lovely views of Quincy, Indian Valley, and the American Valley. As you draw nearer to your destination you will find yourself at the striking foot of Spanish Peak, looking over a spectacular granite landscape. DIRECTIONS: From highway 70/89 going through Quincy, turn right onto Buck’s Lake Road FR 119 towards Meadow Valley. You will travel on this road for a total distance of 9.2 miles. Continue through Meadow Valley, turn right onto a dirt road (24N29X). There will be a sign labeled Silver Lake. Continue on this road for 6.4 miles until you reach The Silver Lake campgrounds. NAMES: The name of this climb was never really established seeing as it is relatively new. As tradition goes it is up to those who climbed it first to give it a name. On a scale of one to five stars in my opinion I would give this climb a three. Don’t get me wrong, this area is an incredibly enjoyable place to climb. Hiking out to the point, being away from civilization for a while, and being in a beautiful place with friends makes this a particularly special place. And, yes the area has potential to be a great climbing destination but, to me its downfall is the underdevelopment in climbing. So what is needed is for more people to get out there and discover new climbs, in order to make it more climber friendly. TIME TO CLIMB: The hike from the trail head to the climb site will take about 30 to 45 minuets depending on how fast you are traveling and how much gear you bring with you. The hike is relatively easy so this time may vary, it all depends on you. SUN EXPOSURE: You will be outside all day so prepare to be in the sun all day. In the mourning the climb is for the most part in the shade. As the day continues the climb’s sun exposure increases as the day goes on, getting more and more sun as the morning rolls into afternoon. At around four in the afternoon the sun heads behind the peak and the climb is in the shade again. RATING: Like the name of the climbs the ratings are up in the air. When facing the wall the climb furthest to the left resembles a 5.10a and the climb to the right has the qualities of a 5.8. DIRECTIONS TO THE CLIMB: Start at the Silver Lake campsite, when facing the lake straight on head left and make your way around the lake. You will run into a sign pointing you in the direction of Gold Lake, set off in that direction. After about a mile of light hiking you will come to a junction indicated by a trail post. To the right is Granite Gap continue onto this trail. After about 400 meters turn right, you will have to leave the trial for this part, keep in mind your LNT (leave no trace) lessons form here on out. 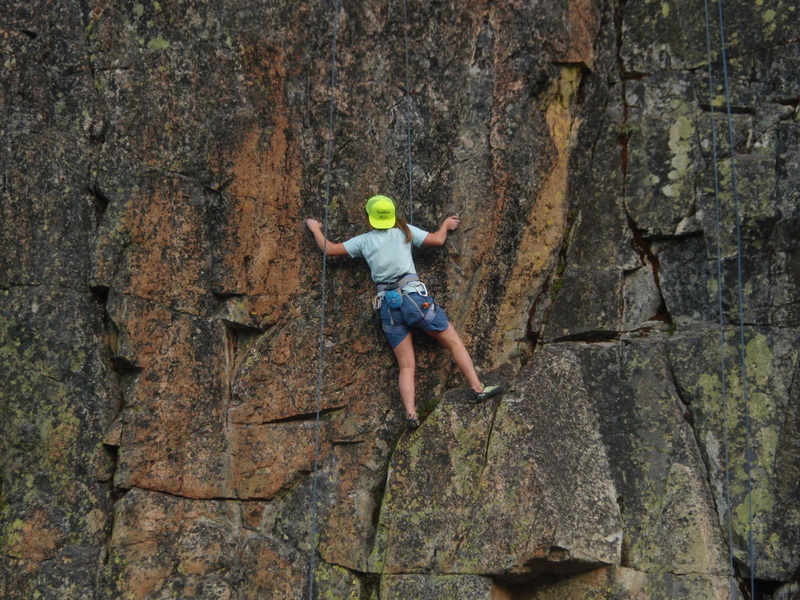 You will travel up a drainage for about 100 meters and then you will see it, the granite wall in all its glory time to climb. If you find that you have miscalculated the distance in which to leave the trail do not worry. You will eventually run into Rock Lake or Gold Lake, Rock Lake being to the right of the Granite Gap Trail and Gold Lake being to the left. The wall you are looking for will be between the two lakes. Keep in mind that you are going off trail and you may find yourself on an exciting adventure trying to find the place. Enjoy it. Once you have located the climbing wall the actual climb is almost directly in the middle of the wall. When facing the wall walk around to the side and find a safe way to climb to the top. Walk along the top of the wall until you are directly over the climb here is where you will see the bolts you will use for an anchor for the climb. There are two bolted climbs on this wall, give both a try. When you get down from the top after safely securing your anchor, watch out for the Manzanita at the base of the climb. RISKS/PITFALLS: Again you are in the outdoors there are always risks you will have to be willing to take. So use common sense, and be careful. This guidebook entry was created by Clancy Thost. This Boulder is located across Spanish Creek from Oakland Camp. It has a few fun lines in the V3 –V4 range. This is the closest place to town to get on some rock. DIRECTIONS: From town, go out Quincy Junction Rd. (the only light in Quincy) to Chandler Rd. Make a Right onto Chandler and continue over Spanish Creek. Make a right on Oakland Camp Rd. and drive (or bike) for 0.9 mi until just before the road crosses the creek again. Make a left onto a dirt road on river left and follow it downstream along the creek until the boulder is visible on the left ~1/4 mile. 1. The Layback – (V3) Start low and do a big move up to the layback rail. 2. Blockhead – (V3) Start on slopers and move up to crimps and side pulls on the scary and possibly loose block. 3. 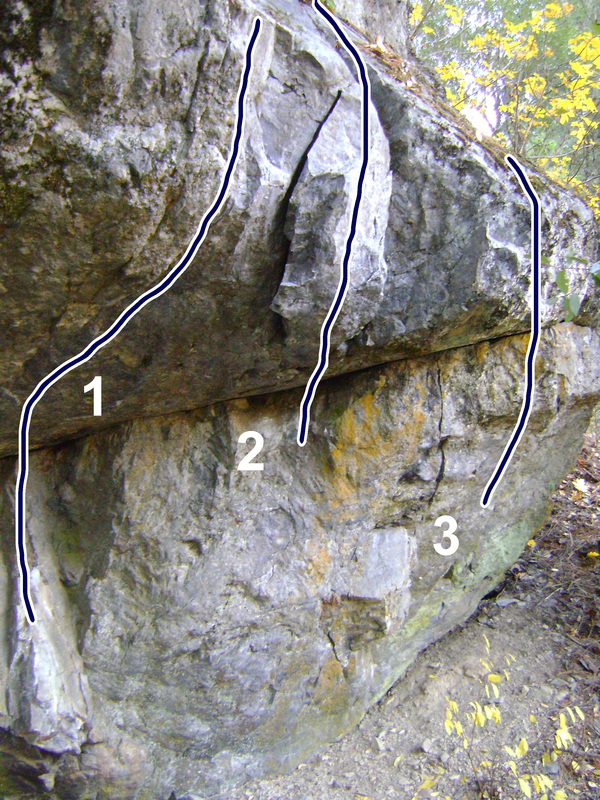 The Other One – (V4) Battle your way up the small and mossy holds. All ratings are very approximate and feedback is welcome. This is a fun place to spend the afternoon. It doesn’t get much sun so it can be cold and it takes awhile to dry out after rain. It doesn’t see a lot off traffic so getting on top (a rope might be needed) and cleaning the top out might be a good idea.